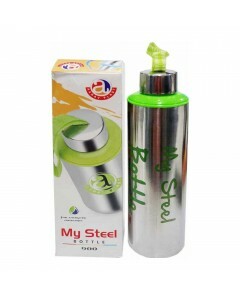 AARAV PLAST MY STEEL BOTTLE 900 1 NO. We love insulated stainless steel water bottles for a few reasons. They keep Juice cold in the summer and coffee hot in the winter, they're lighter and more durable than glass, and they're free of the chemicals found in some plastics. NOTE-Image is for representational purpose only & Packaging or Color of product may vary from actual product.